Transportation to and from the airport was ideal! My late check-in was a breeze and the front desk agent was friendly and informative. The room and bed were very comfortable. Breakfast eggs and sausage were delightful and the property is located conveniently near food and shopping. I would definitely stay again. Location- close proximity to shops, restaurants and walking. Transport to the cruise lines saves us money and time Inclusive breakfast- great variety Pool & pool bar! Very nice staff and good location/area. Hotel not as nice as we thought it was going to be. The staff was absolutely wonderful as busy as they was. They try their best to meet everyone's needs. The hotel is in a very good location and they offer free shuttle to the airport. The older man who helped with our luggage is and always has been a wonderful worker. He goes way above and beyond his job. It is close to the the cruise port. They have a shuttle that will transport you to the cruise port upon request at check in. The hotel has continental breakfast. You can either eat poolside or inside. The bed was comfortable. Pool looks nice. All the girls at the front desk were very nice.i loved my room it very clean. The breakfast was amazing soo many choices to choose from. Great location near shops and eateries. Room was clean and comfortable. The hotel is perfect for a cruise in/out. It’s a bit old but clean. Shuttles to/from airport and cruise port was very convient. Lady at front desk,a assistant manager. Wish could remember her name👍💙 was sweet and gave us discount for shuttle trouble. 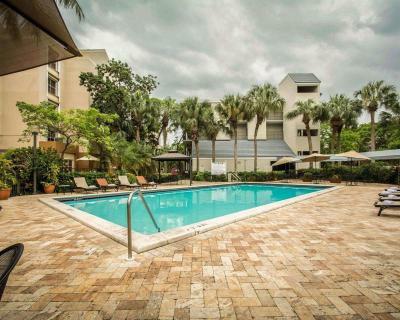 Quality Inn & Suites Ft. Lauderdale Airport Cruise Port South This rating is a reflection of how the property compares to the industry standard when it comes to price, facilities and services available. It's based on a self-evaluation by the property. Use this rating to help choose your stay! One of our top picks in Hollywood.Twelve minutes' drive from Port Everglades cruise terminals and 7 minutes' drive from Fort Lauderdale International Airport with free Port Everglades shuttle service, this hotel provides thoughtful amenities, comfortable rooms and on-site dining options. A free daily breakfast buffet, free WiFi, and access to the outdoor swimming pool are available during every stay at the Quality Inn and Suites Fort Lauderdale Airport Cruise Port South. Beverages are available at Michael's Poolside Tiki Bar. Guestrooms include cable TV, coffee-making facilities, and a private bathroom equipped with a bath or shower. 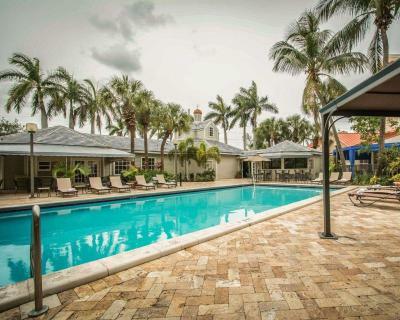 Popular area points of interest, including Gulfstream Park and Calder Raceway, are located about 16 minutes' drive from this Fort Lauderdale Airport Cruise Port South Quality Inn and Suites. The Hard Rock Casino and Dolphin Stadium are less than 20 minutes' drive. When would you like to stay at Quality Inn & Suites Ft. Lauderdale Airport Cruise Port South? This room features a cable TV, desk, and coffee-making facilities. This room features a cable TV, desk, and coffee-making facilities are provided. This suite features cable TV with HBO® movie channels, sitting area with a sofa bed, and desk. A small refrigerator and a microwave are also included. This room features cable TV with HBO® movie channels, desk, and small refrigerator. A 2-person table, microwave, and coffee-making facilities are also included. This room features a cable TV and a desk. A small refrigerator and a microwave are also included. House Rules Quality Inn & Suites Ft. Lauderdale Airport Cruise Port South takes special requests – add in the next step! Quality Inn &amp; Suites Ft. Lauderdale Airport Cruise Port South accepts these cards and reserves the right to temporarily hold an amount prior to arrival. Quality Inn & Suites Ft. Lauderdale Airport Cruise Port South accepts these cards and reserves the right to temporarily hold an amount prior to arrival. Extended on-site parking is available for guests with ongoing travel by plane or cruise ship. Contact hotel for details. Please note if guests request to park outside of their stay dates, a surcharge will apply. Guests may call the property after airport baggage claim at the phone number on the booking confirmation for pick-up. The airport transfer service is not available after 24:30. Guests who require transfer service to Port Everglades Cruise Port or Port Miami must make arrangements at the front desk upon check-in. Please note that the property pre-authorizes cards for all reservations. Contact property for details. Please note shuttle fees apply for an additional night's stay, vehicle pickup after a trip, or airport transfer. Please contact the property for details. I arrived late and nothing was open for snacks or water. A mini bar or vending machine would be nice! Room need renovation for the price. Good place to stay for one night. One of the bartenders at the pool was a little rude and seemed like she was not happy to be working or having to serve us. The comfy beds and pool. Front lobby was crazy busy. Totally under staffed (although the staff were very pleasant) I just felt sorry for them- especially the bag guy... he needed help! Unfortunately our room wasn’t as clean as I’d hoped. Two hour delay in getting room at checkin Booked shuttle night before didn’t appear on list next day, delayed 90 minutes next day Room keys not working twice ! That the prices to me were expensive. That they didn't have more than one person taking bags, helping families for their cruises. For a lot of people & families that come in and out you would think it would be bigger and not so run down. Check in time is too long. I feel when you get there your room should be ready not having to wait. For safety purposes they should fix the loose bricks around the pool area and put a cap on one the pool drainages before someone sprains their ankle really bad.